"What an extraordinary woman and role model for me! During..."
"Pat was such an upbeat person, who contributed so much to..."
"Dear Bob and Penny and Pat's family, I am so sad to read of..."
"So sad to learn of Pats death. She was a great friend to..."
SCARBOROUGH - Patricia Carson Mordecai, 80, of Scarborough, died peacefully at Gosnell Memorial Hospice Home on Feb. 7, 2019, from cancer. She was predeceased by her loving husband of 28 years, Donald D. Mordecai. Patricia leaves her daughter, Barbara Nason and husband, Peter Sherman, son, Thomas Nason and wife, Jennifer Martin, stepsons, Daniel Mordecai and David Mordecai; brother and sister-in-law, Robert and Penelope Carson; grandchildren, Leeland, Marshall, Emma, Alexandra, Gillian; great-grandchild, Oliver; and numerous nieces and nephews. Patricia (Pat) was born in Orange, N.J., and brought up in New Rochelle, N.Y. She graduated from The College of Wooster, in 1960, where she met her first husband, Charles (Chuck) K. Nason. Pat was married to Chuck for 24 years and raised their children in Wayland, Mass. In 1985, Pat married Donald D. (Don) Mordecai. After residing in Wayland, they moved to various places, following their careers, in Connecticut, Washington, D.C., and New York. 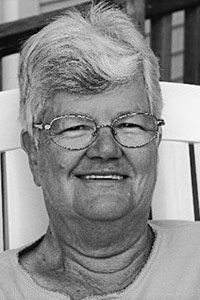 Pat had a life-long and commemorable career with the Episcopal Church, both nationally and locally, including the Episcopal Divinity School in Cambridge, Mass., the Episcopal Diocese of Massachusetts, and St. Albans Church in Washington, D.C. From 1998, until her retirement in 2006, she served as the Chief Operating Officer of the national Episcopal Church USA in New York City. Following retirement, Pat and Don moved to Castine, where they were active in the town and church affairs, and enjoyed gardening, boating, walking, music, and reading. In 2011, Pat and Don moved to Scarborough, where Pat was very active at St. Mary's Episcopal Church in Falmouth and the Scarborough Garden Club. A memorial service will be held at 11 a.m. on Saturday, March 2, at the Episcopal Church of St. Mary, 43 Foreside Road, Falmouth. Arrangements entrusted to Hobbs Funeral Home, Scarborough. Online condolences may be expressed at www.hobbsfuneralhome.com.